The primary purpose of your HVAC system is to provide for all of your comfort needs. The relative temperature of your home is only one of the factors when it comes to comfort. Another is the humidity within your property. At Steele Mechanical, LLC Air Conditioning and Heating, our air conditioning company installs whole-house humidifiers in New Jersey to assist with this. Whole house humidifers are installed directly into your central air system, and control humidity levels through the entire house. The results will be absolutely spectacular. By customizing both the temperature and humidity within your residence, you and your family will enjoy the most enhanced level of comfort possible. The ease of use and supreme control of a whole-house humidifier is amazing. You and your family are guaranteed to be completely satisfied with your new system. If you are interested in the many benefits of a whole-house humidifier, call Steele Mechanical, LLC Air Conditioning and Heating today. Our courteous and polite New Jersey indoor air quality specialists would be happy to take your call and to answer any questions that you may have. We can schedule your appointment today. During the New Jersey winter, one of the most aggravating home comfort problems is a lack of moisture in the air. As we run our furnaces heavily to keep our homes warm, the systems take more and more water out of the air. This leads to dry skin, respiratory issues, and other ailments. Our professionals can resolve these yearly problems by installing a whole-house humidifier directly into your HVAC system. It will add moisture to the air in your home that will be delivered by your vents to every room of your residence. You will be able to control the relative humidity of your property via your thermostat in the same way that you control temperature. 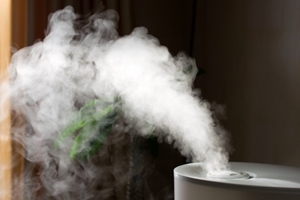 The benefits of installing a humidifier in your home are quite astounding. As alluded to earlier, one of the major reasons you should consider this addition to your HVAC system is that your humidifier will improve the comfort that you and your family enjoy on a year-round basis. Proper humidity levels can help prevent asthma, dry noses, cracked and itchy skin, allergies, and sore throats. In addition, a whole-house humidifier can reduce the chances of your family members contracting viral infections that thrive in low humidity environments, like the cold. Your new system can help protect portions of your property susceptible to drying out and cracking. Lastly, your new humidification system can help reduce the amount of energy that your heater and air conditioner use within your home. Specifically, you can keep your property at a lower temperature in the winter time but feel the same level of heat because of a higher relative humidity. If you would like an estimate for whole house humidifiers in New Jersey, please call 609-259-3210 or complete our online request form.